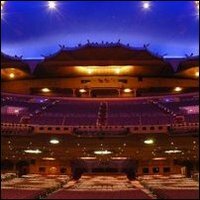 The fabulous Fox Theatre is one of Atlanta's premiere venues for live entertainment. The Fox's 4,678-seat theatre is booked for more than 300 performances a year ranging from Broadway to rock to comedy to movies. The theatre, originally the Yaarab Temple Shrine Mosque, was designed in the late 1920s as headquarters for the Shriner's organization. It was a beautifully outlandish, opulent, grandiose monument to the heady excesses of the pre-crash 1920s, a mosque-like structure complete with minarets, onion domes, and an interior decor even more lavish than its facade.